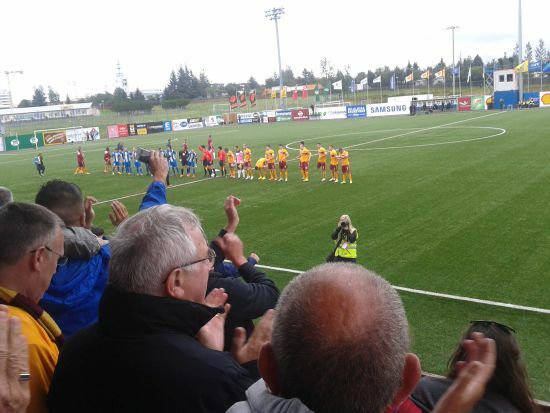 Many felt that the missed opportunity in the first leg (a two goal lead) would e put right when we visited Stjarnan's ground outside Reykjavik. With another week's training it was hoped that we would be able to progress. Their small stadium had a capacity of around 1,000 and there were fears that not all the travelling fans could be accommodated. But when the team (unchanged from the first leg) ran out on the artificial surface they were with a strong vocal support. All seemed to go well and we took the lead with a Hammell header after 10 minutes. Lasley conceded the third penalty of the tie. Ainsworth's volley gave us the lead in the second half but Toft's goal, following our defensive substitutions, sent the game into extra time. The sad tale was complete when a rocket from Johannson won the tie.